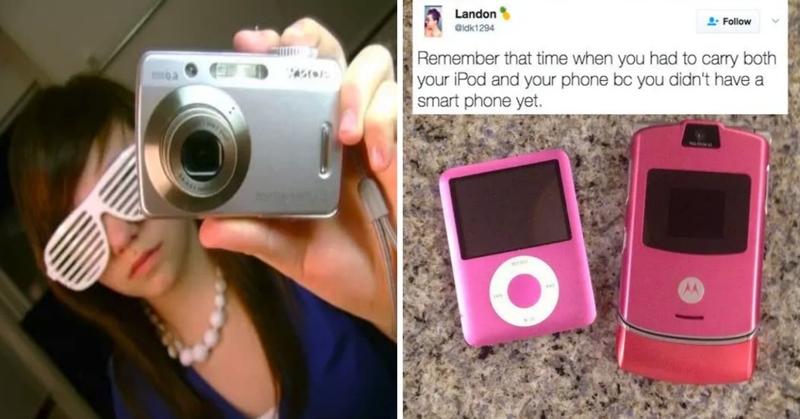 20 Things That Everyone Did 10 Years Ago That Are Totally Embarassing Now! With the 10-year picture trend doing its rounds on all the social media platforms, (or the ‘how hard did puberty hit you?’ challenge, what ever you wanna call it! ), it’s easy to believe that people love looking back and even laughing at their 10 year a go self! And why not, some of us have changed dramatically, while others stay the same…that’s life! But sometimes it can be good to look back and see how far you’ve come, not just physically, but mentally as well. Hey! I don’t think this is that embarrassing, I loved this filter if I’m honest. I thought it was very Andy Warhol. I felt very arty. & When you look at all the ridiculous Snapchat filters we have nowadays, it isn’t that bad, really. I certainly don’t remember this…nor do I remember actually doing it. Oh well, it sounds ridiculous and annoying, so I’m kind of glad of that fact. Ahhh, I remember those days. Actually, I see my posts on Facebook memories from 2009 and I literally just want to decapitate myself for being so STUPID and whiny…Jesus, girl! ‘HAVING SOME TOAST, LOL’ was just not clever…or cool, it was dumb as. I’ll admit this was a bit cringe and emo, but it isn’t that bad really, it’s kind of cute…and hey, we were young! Ahhh, the good ol’ days of MySpace, god how I miss that place. No other social media platform has got anything on it! Fancy titles, spending hours picking a cool profile song and of course, the controversial yet thrilling, ’10 top friends!’ Many a friendship was ended due to that thing….ah, happy days! I just laughed my drink down my nose at this, seriously! I’d forgotten all about those naff, early apps on the iPhone. Mind you, I still remember being mesmerized by them at the time, I thought they were amazing! Now look at all the apps we have, we literally have apps that make your dinner for you and turn off all the lights in your home. That’s some weird, space-age sh*t right there! 9. Also…the one where it looked like you had a lighter! I remember using this at all the concerts I went to at the time, I thought it was awesome! But really, what was the point of it now, when you think back!? Oh my, I remember this. My then boyfriend was obsessed with them and he did my skull in with it! Where did it even come from!? I’m so glad that this one disappeared. It got old very quickly. To be honest, I LOVED my Blackberry, it was purple and lightweight and preeeeety! I miss it a lot, but alas, Apple trampled all over their dreams eventually…as they often do. Actually, I used to LOVE watching TV shows and movies on my little green, shiny iPod. I was amazed by it, quite frankly and it was SO cute. The quality was pretty damn good for such a small screen as well, so don’t knock it, guys! Why we did this, I actually have no idea, but I remember trying it. I used to think that it was just for all the underage kids who shouldn’t be on there. But no, it seems it was just some kind of weird novelty, like most things on this list. That’s why Blackberry’s where the BEST! If you were a texting machine and you had to send a message in private, then you could do it whilst the phone was in your pocket and no one would be any the wiser! Imagine trying to do that with an iPhone these days!? 19. When we took selfies on a big as* digital camera!